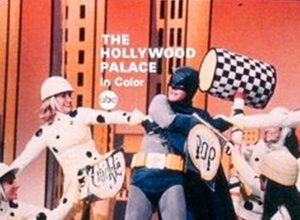 This week we just aim to entertain and confuse with an entire episode of The Hollywood Palace that originally aired October 6, 1966. 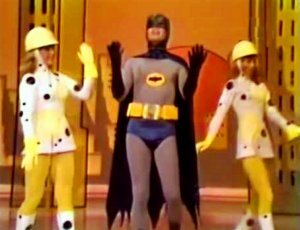 This edition of the anthology variety show was hosted by Adam West…in costume as Batman. In addition to Mr. West’s dulcet tone crooning “The Orange Colored Sky” and “The Summer Wind,” we are also treated to dynamic vocal performances by Ray Charles and The Rayettes, Roy Rogers and Dale Evans, and none other than Joey Heatherton! We also get a pre-hippie George Carlin doing a routine about the American Indian, and novelty acts include a ventriloquist, a high-pole performer, and a slapstick troupe of little people. The Hollywood Palace was an hour-long variety show from ABC from 1964 to 1970. It was named after its host venue, the one-time Hollwood Palace theater (now known as Avalon Hollywood). On the first season, the “billboard girl,” who would change out the placques with the performer’s name was a then-unknown Racqel Welch. The show itself unintentionally became a bit of a train-wreck clash between established Hollywood, and the 1960s rock generation. The Rolling Stones made their US television debut on The Hollywood Palace, and were mercilessly mocked by that episode’s host, Dean Martin. Throughout the series, a mix of established stars like Bing Crosby, Jimmy Durante, Louis Armstrong and Ginger Rogers mixed with then-cutting-edge comedians like Carl Reiner and Mel Brooks, Jackie Mason and Shelly Berman, and then-daring rock performers like Janis Joplin, The Hollies, The Cyrkle and Marvin Gaye. You gotta love a show that lists Martha Raye, Ravi Shankar, The Muppets and Tiny Tim among its roster of guest stars. Anyway, enjoy this taste of 53-year-old pop culture insanity.